I have lived in Lexington for almost 9 years. I have driven past these awesome bronze sculptures a hundred times. On Sunday, I decided to take a closer look. Never before had I realized that there was more park just over the wall, behind the fountains. Just out of sight from the road, are several more beautiful bronze sculptures. A paved walkway through the park is dotted with bronze plaques memorializing notable people in the horse industry. There is also a small bronze statue of "Lexington", the famous 19th century racehorse. Click here to learn more about the artist Gwen Reardon. 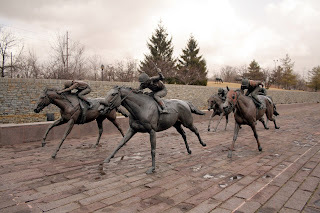 Click here for a funny look at Thoroughbred Park!